‘A woman cooks for love of her man, a chef for himself, for his pride.’ Robert J. Courtine, quoted in The Taste of America by John and Karen Hess (1972). Robert J. Courtine, French food writer and editor of the 1984 French edition of Larousse Gastronomique, expressed the difference between haute cuisine and home cooking in terms of who was doing the cooking and why. Eating in a good–or a great–restaurant is a memorable way to spend an evening. No one would argue that a chef’s only motivation for wanting to please a diner in his establishment must invariably be the cold hard profit line or his ego. At the same time, Mr. Cortine’s remark points to the essential strength of home cooking. It is designed to please the people one cares about most. That is a sound recommendation for a recipe…like this one for Little Verrines of Fresh ‘Ratatouille’, devised by a home cook for her family. Timing Note: The 3 layers of ingredients for the verrines may each be mixed separately and refrigerated several hours in advance. If the vegetables aren’t being cut and seasoned very far in advance, allow at least 30 minutes for them to marinate in the refrigerator before making the verrines. Assemble the verrines right before serving. 10 1/2-cup size clear Glasses: A ‘verrine’ is composed of several different ingredients layered in a clear glass. Verrines may be sweet or savoury. 1. Preheat the oven to 375 F. Cut the eggplants in half lengthwise, rub a little olive oil over their cut surfaces, place them cut side down on the baking sheet and roast them until they are tender–or for, perhaps, 30 – 40 minutes. 2. When the eggplants are cool enough to handle, scrape out their roasted flesh with a spoon into a bowl. Discard the empty shells. 3. Heat 1 Tablespoon of the olive oil in the frying pan, add the eggplant and cook it over medium heat for a minute, stirring it about with a wooden spoon or spatula. Add the thyme and a few grinds of pepper and salt and cook a few minutes more to combine the flavours…then, set the eggplant aside to cool a few minutes. 4. When the eggplant has cooled a bit, place it in the processor with 1 Tablespoon of lemon juice and the 2 teaspoons of Dijon mustard. Process until the mixture is smooth. Transfer it to a bowl and add 1/3 of the green onions. Cover the eggplant mixture and refrigerate it. 1. Toast the coriander seeds in a dry pan for a minute or two until they pop and become fragrant. Crush them coarsely with a mortar and pestle or on the side of a broad knife blade. Crush the pink peppercorns in the same way. 2. Cut the zucchini in small cubes and place them in a bowl. Mix the little cubes with 1 Tablespoon of lemon juice, 1 Tablespoon of olive oil, the crushed pink peppercorns and the toasted, crushed coriander seeds. 3. Stir in 1/3 of the green onions. 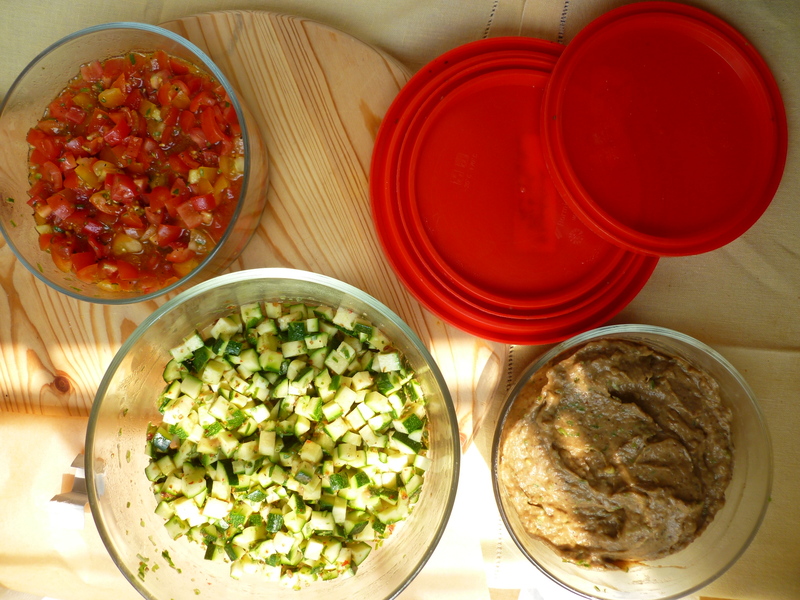 Cover the bowl and refrigerate the marinated zucchini. 1. Cut the tomatoes in small pieces. Place them in the third bowl and mix them with 2 Tablespoons of olive oil, the chopped fresh cilantro (coriander), the last 1/3 of the green onions, and several grinds of black pepper and salt. Cover and refrigerate the tomato mixture. 1. 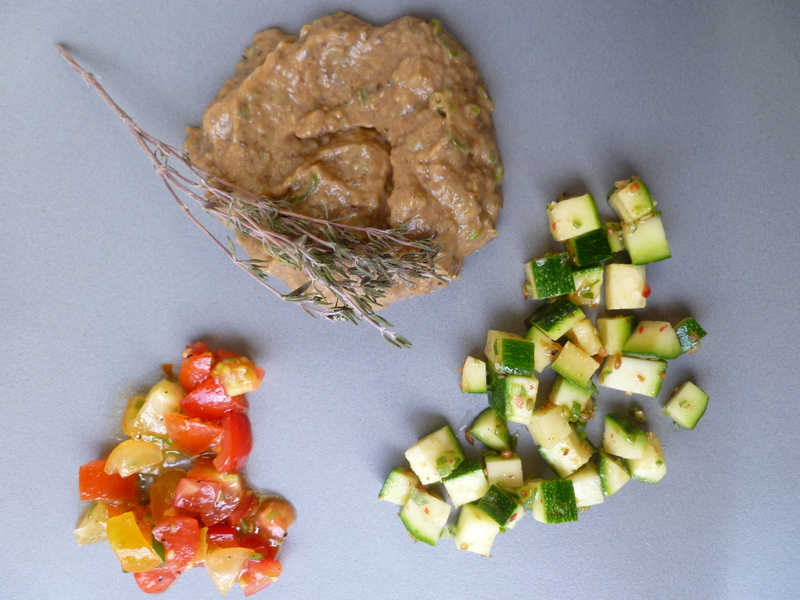 Spoon into each glass: first, a layer of eggplant; second, a layer of zucchini; and last (on top), a layer of marinated tomato. 2. 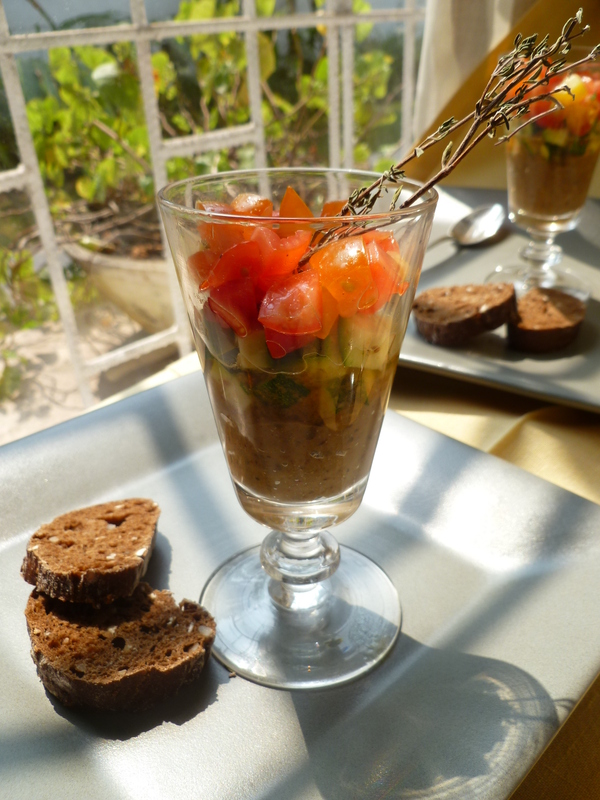 Place two rounds of bread at the side of each verrine. 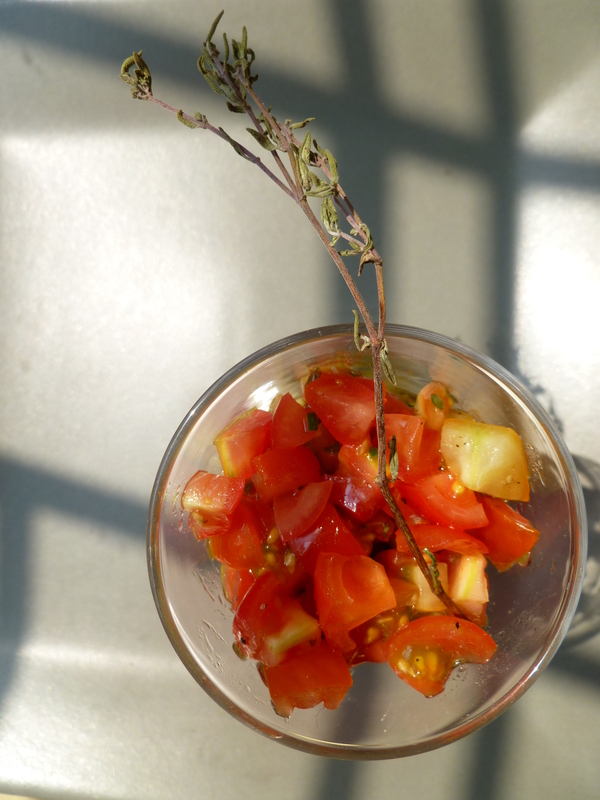 Arrange a twig of dried thyme on top. 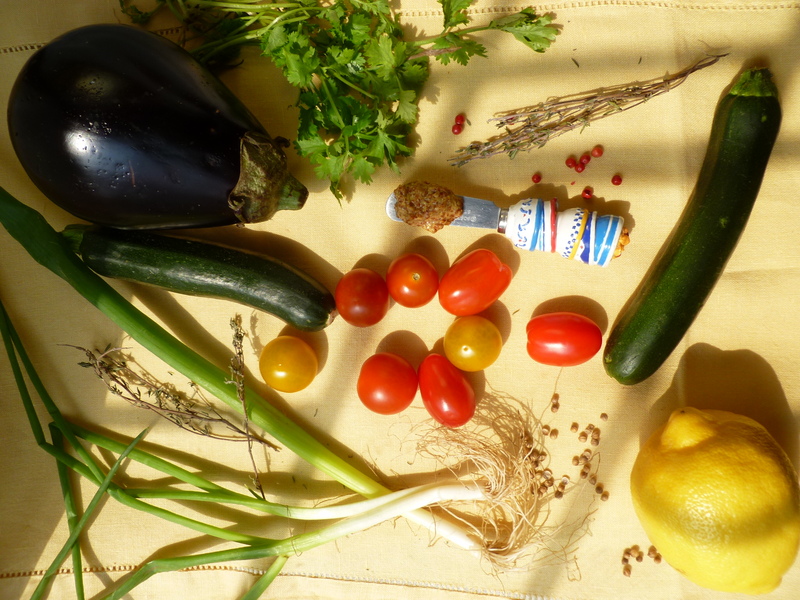 A Note: Little Verrines of Fresh ‘Ratatouille’ is the Salad Course of the Dinner Menu: Mixing Dinner and Business. 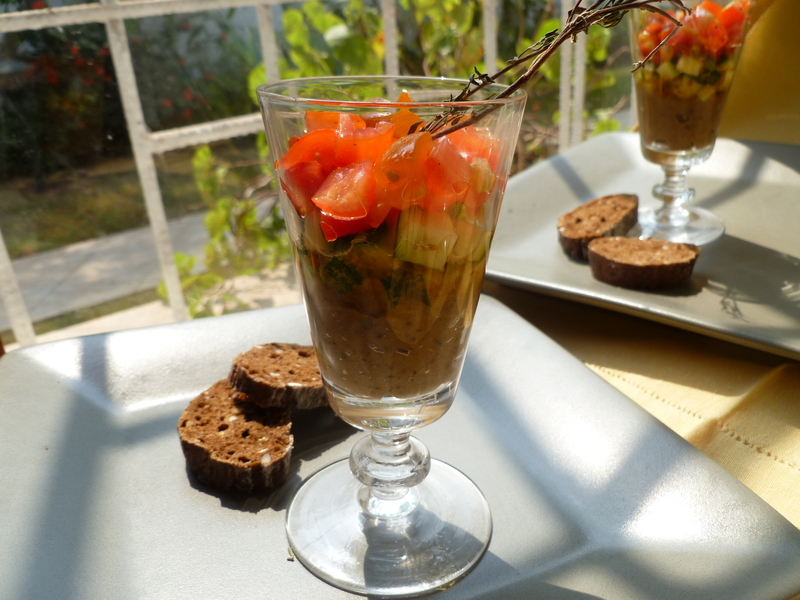 An Acknowledgement: Little Verrines of Fresh ‘Ratatouille’ is adapted from a recipe for ‘Fresh Ratatouille-inspired Verrines’ on the food blog Papillotes. The author of the blog is an example of a cook whose recipes are shaped by a thoughtful consideration of her family and their tastes. She is, as well, a photographer, whose pictures are well worth a visit to Papillotes.